As long as black men are assumed to be armed and dangerous, Stand Your Ground laws will produce more Trayvon Martins. It was a remark exceptional only for who said it. Across the country, black parents expressed similar sentiments, again reminded of a too-familiar reality: from Oakland to the Bronx their children are walking targets. But unlike the killings of Oscar Grant or Ramarley Graham, who were shot dead by law enforcement officers, Martin’s death led few to suggest that he had it coming. Not only was his killer heard muttering what sounded like a racist slur; Zimmerman was a serial 911 caller with a penchant for reporting “suspicious” black men. Last year he reported a boy he estimated to be 7 to 9 years old. On March 19 the Justice Department announced that it would investigate Martin’s killing; many called on Attorney General Eric Holder to prosecute it as a hate crime. More deserving of scrutiny is the Florida law that could help Zimmerman escape accountability. The 2005 Stand Your Ground law broadened the circumstances under which a person is “justified in using deadly force” to include virtually any place a person might feel threatened. A person who responds lethally is protected from criminal prosecution or civil action. And according to the statute, a police department is barred from making an arrest “unless it determines that there is probable cause that the force that was used was unlawful.” It is this clause that local police have used to defend their refusal to detain Zimmerman. The Stand Your Ground law may be the first and most famous of its kind, but similar measures have been signed in more than twenty states over the past decade. Lurking behind this wave is the right-wing American Legislative Exchange Council, better known as ALEC, which has peddled the bills for years at the behest of the NRA. Dubbed “castle” laws, after the notion that “a man’s home is his castle,” they have led to “justifiable homicides” that are hard to justify. Before Trayvon Martin, there were Diego Ortiz and Miguel de Jesus, two black men shot in the back by Texan Joe Horn, who, ignoring pleas from a 911 dispatcher and invoking his state’s new castle law, killed them to stop them from robbing his neighbor’s house. Horn successfully claimed to have acted in self-defense. But what if the only “poor decision” was walking outside to buy Skittles and iced tea? 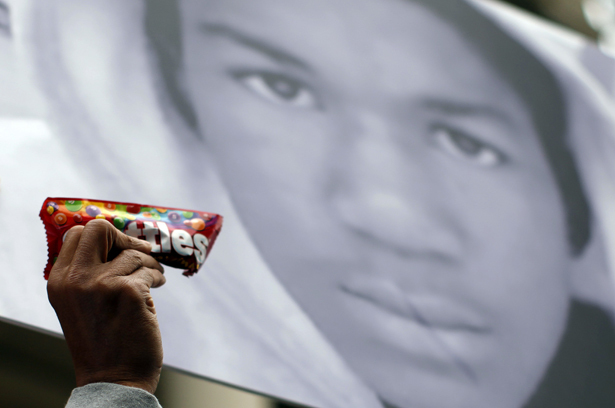 Whatever degree of criminality might be assigned to Ortiz, de Jesus or Morrison, Trayvon Martin’s only crime was, as Melissa Harris-Perry writes on page 10, “being black in public.” The racism—conscious or unconscious—that animates people’s fear and mistrust is reason enough not to encourage Americans to respond with bullets to perceived threats. As long as black men are assumed to be armed and dangerous, Stand Your Ground laws will produce more Trayvon Martins.